In April of 2012, my neighborhood was hit by a freak hail storm that left 85% of the homes with severe roof damage, broken windows, cracked or missing siding and a ton of repair bills. Like most, I contacted my insurance company, initiated a claim and was told to get bids. I had 3 different companies provide written estimates and each time the insurance company rejected the proposals. Needless to say, I was extremely frustrated. In July of 2012, I received a flyer on my front door from Titan Roofing. I gave Joe Savalla a call and explained my frustration. To my surprise, he showed up at my house that evening and began taking pictures and measurements. Within 2 days, Joe presented me with a 15 page proposal outlining damages I had not even considered. The document was complete with estimates, satellite imagery and a guarantee of workmanship and warranty. I was impressed, but not sold. Approximately 1 week later I witnessed Joe go toe to toe with my insurance adjuster, something none of the other roofers were willing to do. Joe continued to work with my insurance company over the course of a month insuring that all damage was paid for. Now I’m sold! Joe is a great guy who runs a professional business. He knows the industry and isn’t afraid to push back on the big insurance companies to satisfy the customer. His roofing, siding and gutter crews were top notch and completed the jobs on time. His customer service and follow up really sealed the deal for me. 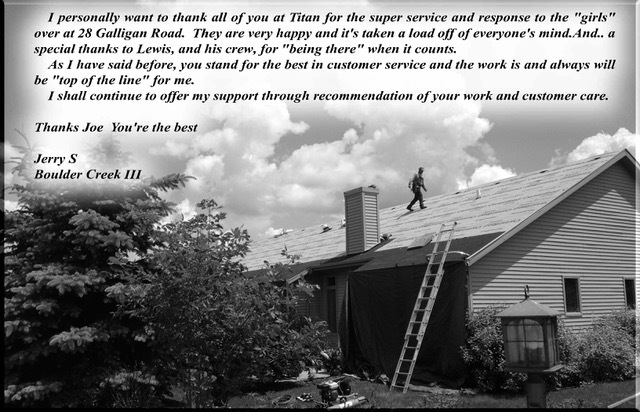 I would highly recommend (and have recommend them to several of my colleagues) Titan Roofing and Joe Savalla. Joe Savalla has been working with me on my home repair project since June of 2011. Mr. Savalla has been very helpful with our needs with directing his crews at reconstructing our home repairs. Mr. Savalla has been exceptionally professional and courteous. Because of the trust he built with us we went with him and couldn’t be more happy. I would highly recommend him to anyone who would like their homes remodeled or repair. Titan Group, LLC. (Mr. Joseph Savalla, President) installed a new roof, siding, gutters etc.. This was performed in a very professional, timely manner and everything was perfectly cleaned up when done. We are enjoying a far more superior roof than the pre-existing roof at a very competitive price. The final inspection with our mortgage inspector who had installed roofing for more than 30 years commented that our roof is a first class job. Overall, the job was done to the highest caliber and we are so happy that we went with Titan Group, LLC. 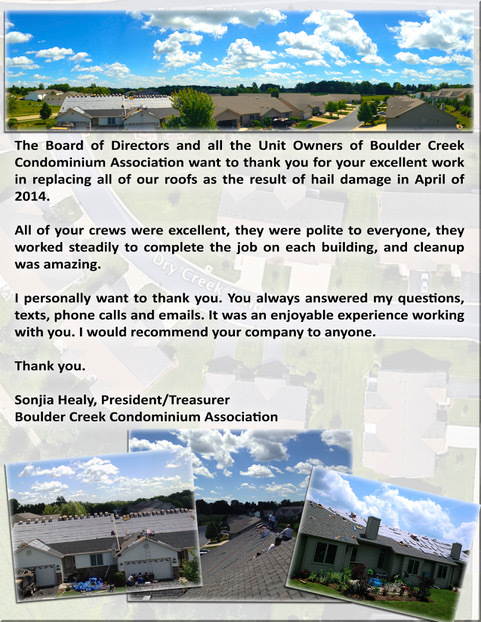 The Board of Directors and all the Unit Owners of Boulder Creek Condominium Association want to thank you for your excellent work in replacing all of our roofs as the result of hail damage in April of 2014. All of your crews were excellent, they were polite to everyone, they worked steadily to complete the job on each building, and cleanup was amazing. I personally want to thank you. You always answered my questions, texts, phone calls and emails. It was an enjoyable experience working with you. Subject: Roofing replacement for Boulder Creek Condominium III due to hail damage. I would like to take this opportunity to extend my gratitude for the excellent work performed on our condominiums this summer. You are aware that we were a bit confused at the process in which the assessments made by the insurance adjusters was lower than expected and would not have compensated for work required to correct the full damages to our roofing concerns. We obtained several estimates from different restoration organizations but we realized that the services offered by Titan Group were more in line with the requirements we needed for quality results. You professionalism in handling the details by direct involvement and working with our insurance group gave us security in knowing that we would receive the proper services required at the right price and coverage. The Titan crews were very knowledgeable, worked diligently and with professionalism that assured us that the job was done right. Today we have gone over every detail that you said you would do and we have found NO irregularities or variations in what we were told. We commend you for this professional attitude and process that gives us a sense of pride that we would recommend your services to anyone requiring restoration services. So you know I have been told many times by my close friends what a great job you have done. I referred Titan many of the top brass friends that require Exceptional service and no crap – believe me many of the people you serviced would be bulldogs – to me – if anything was a problem. Joe, good to hear from you. Hope all is going well. 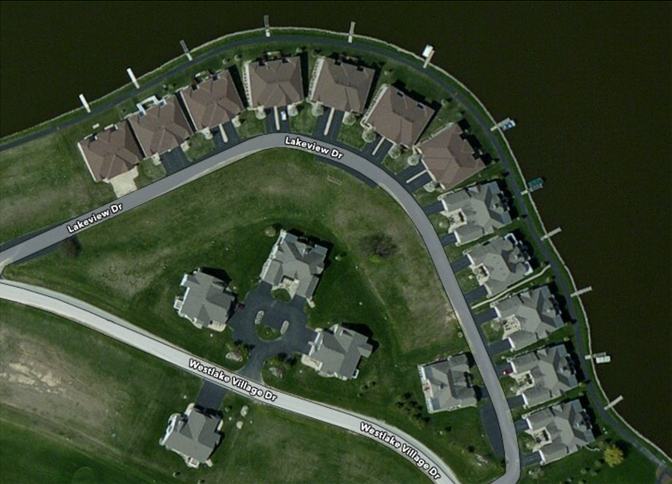 Our Condo’s had storm damage in May of 2011. All of the roofs were replaced and many also had gutter and siding damage. Your follow up with the Insurance Companies and total coordination with the individual owners, was outstanding. The total restoration was completed on schedule. After State Farm agreed to pay for half of my roof, they sent an engineer to inspect the rear of my home. The engineer also denied this portion. Joe Savalla of Titan Armor-Coat Exteriors submitted a detailed estimate including items that were missed. With Joe’s persistence and knowledge of the industry, we won our settlement and we are now enjoying our new roof.